One of a number of avenues running from the central “plaza de Espana” is that of la Ferreria which, along with the other streets connecting from it, makes an interesting little district for tourists to explore. This area includes the plaza Campo Sagrado, the plaza of Carlos Lobo and the streets of Jovellanos, Sol, Los Alas and a couple more. As ever, you are never far from the plaza de Espana and cafes and bars are always popping up as you round a corner or near a square. At the junction of the Calle de la Ferreria and the Calle de Sol sits the Casa de Valdecarzana. This building, whilst small, dates back to the fourteenth century and it is one of the most important buildings in the city. 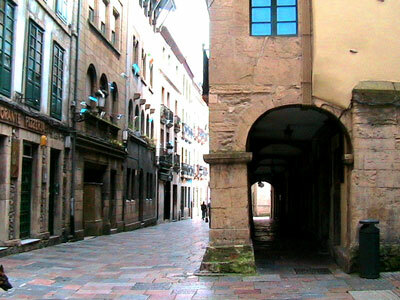 Both these streets (Ferreria and Sol) have a number of medieval buildings on them and you can walk under the facades of these buildings by passing through the colonnaded archways beneath them. 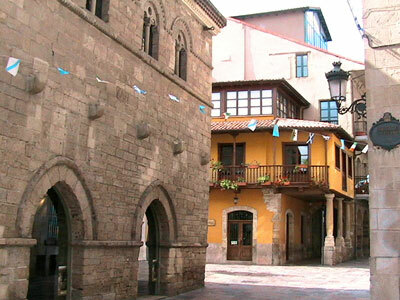 Ferreria street in particular has a distant heritage and it is also one of a small number of Aviles' streets that is almost completely constructed of stone faced properties. 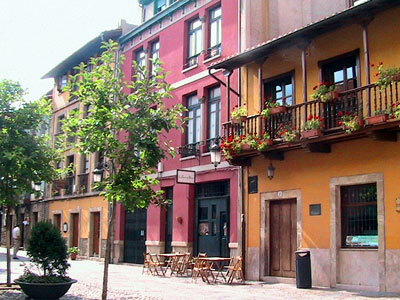 With a slightly darker atmosphere and feel to it than other parts of this historic quarter, Ferreria Street leads down to the square of Carlos Lobo. This is one of the oldest plazas in Aviles and to one side of it is the Iglesia de los Padres Franciscanos (church). Dating back to the twelfth and thirteenth centuries, this small church was central to the layout of the earliest town of Aviles and, although uncomplicated in design, its slightly elevated position gives it a certain authority over the district. The church has a simple but elegant portico and a small bell tower. It is still used actively today and it courtyard is often the venue for concerts and performances. Almost next door to the church of Padres Francscanos is the Capilla de los Alas (chapel). Again this is one of the older buildings in the town with a construction dating back to the fourteenth century. This building's charm does however lie in its age rather than it appearance. Behind the two churches mentioned above lays the Muelle park. This is a small landscaped area with a few statues and a canon and beyond this point the newer parts of Aviles gradually start to mix and merge with the old. Staying roughly in the same vicinity as the churches and the park, another square, the plaza Campo Sagrado, connects to la Fruta Street. 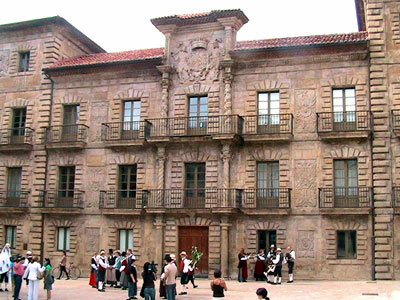 At this juncture sits one of Aviles largest and most monumental buildings, the Palacio de Camposagrado. Built in the seventeenth century in a vaguely baroque style, this structure has an ancient look to it and features numerous large and detailed stone carvings on its main facade. It has two wings and a narrow central projection and looks like no other building in the city. Dependant upon taste the Palacio de Camposagrado will be either liked viewed as strangely garish, but it will undoubtedly make an impression either way. All around this area are classic examples of Asturian and Aviles' architecture and, although many are on a small and sometimes tiny scale, they offer an insight into the development of the old town from its medieval beginnings through to the present. Just below the area spanning off from la Ferreria Street is the port of Darsena de San Agustin and close to this is the town's tourism office. The path from this spot back up to the plaza de Espana is definitely an up hill one, but again takes in some typical Asturian street scenes and confirms that Aviles is probably the best of the region's cities for a tourist to visit.